In preparation for ForeFlight 7.7, coming this week, we have released a new Terrain Map for download in the app. ForeFlight 7.7 includes a number of under-the-hood improvements to the ForeFlight Map Engine, which requires the new Terrain Map. The new Terrain Map is available now in More > Downloads, at the bottom of the Required Downloads section. 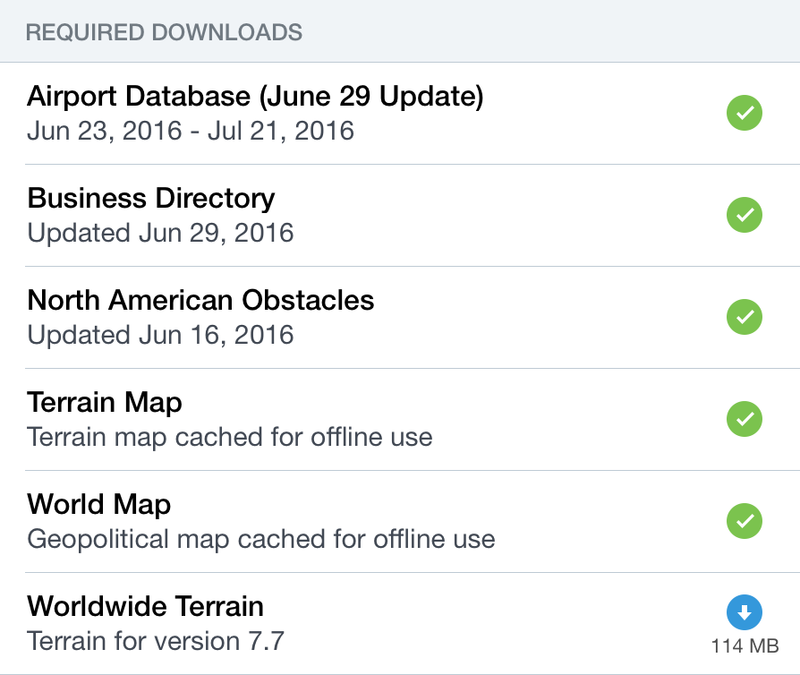 Please make sure to download it before your first flight with ForeFlight 7.7, as it will be required in order to use the Terrain Map layer on the Maps view. Also, don’t forget that ForeFlight 7.7 changes the minimum required iOS version from iOS 8.2 to iOS 9.2, so if you haven’t already updated your devices to at least iOS 9.2 please do so before downloading ForeFlight 7.7.